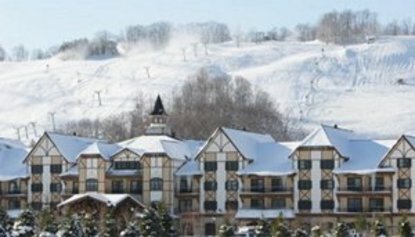 Mountain Grand Lodge and Spa is located in the heart of Boyne Mountain Resort. The hotel opened May 2005 and is attached to Avalanche Bay Indoor Water Park and also has a full service spa. All accommodations and the water park are Austrian/Swiss themed and a short walk to the ski slopes. The water park and hotel are located in a resort village and have endless activities year round. Activities include two championship golf courses, downhill and cross- country skiing, mountain biking, tennis, disc golf, beach, ice-skating, and seasonal chairlift rides.